← Did you respond to the DG COMP call – here is our response for your comments and feedback. How to guarantee profitability of your FTTH network with a comfortable margin? “In order to ensure that the FTTH is deployed in the most efficient manner, a competition for the market could be introduced to choose the most efficient FTTH network operator at the local level. In the UK there has been an apparent shift by OFCOM which DOUBLES the time to breakeven for the competitors compared with the incumbent?? revenue……reduction pushes tenants’ potential break-even period to 20 to 25 years. This is double BT’s expected break-even period for its Infinity fibre to the cabinet programme. Is the competitors’ access to the networks being opened up by the incumbent operators without fear or favour? Please tell us what you see happening in your region. We notice a very high price for PLC splitters for GPON systems. Even though the optical component itself is reasonably price, it is marked up tremendously by cabinet manufacturers who merely package it in their custom-shaped boxes. There is no special technology in the box. It is just a way to lock the customer into paying an exorbitant price for a fiber-optic splitter. 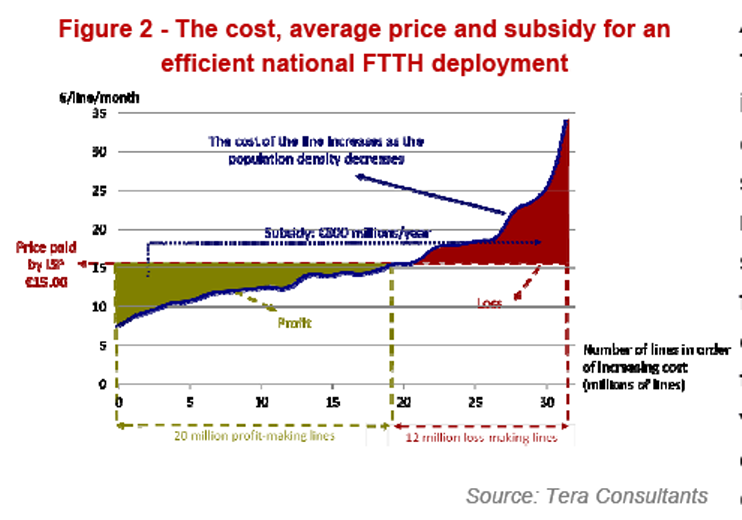 The unbelievably bad business case for FTTH! All just to avoid the SLU discussion. Why not use the infrastructure in place?